Kristin Thorne has an update on the collapse of five apartment balconies in Long Beach. 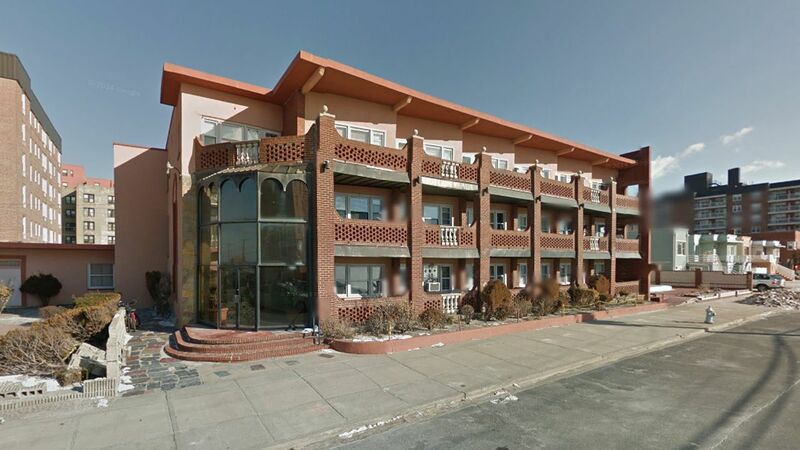 LONG BEACH, Long Island (WABC) -- Several balconies fell one on top of the other Tuesday morning from an apartment building in Long Beach, Long Island. 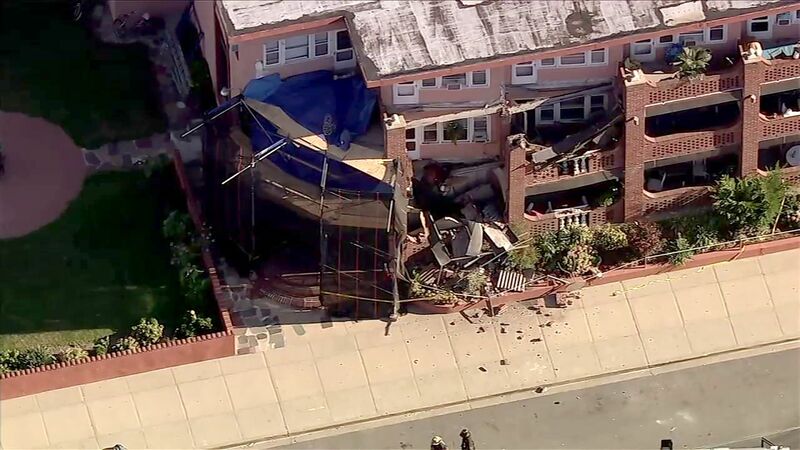 Five balconies collapsed at the building at Shore Road and Long Beach Boulevard. Long Beach Police said no injuries were reported. "It seems the middle balcony may have given and then the top one came down," said Long Beach Fire Department Chief Robert Tuccillo. "Thank God it happened early in the morning. No one was sitting on their patios. No one was walking by." The building is in the early stages of construction. Fire officials said a company set up scaffolding just a few days ago to repair decaying bricks, and that was enough to cause everything to fall. "This wasn't safe from the get go. That scaffolding just helped it come down," said Tuccillo. "I was in bed and I heard a large crash. I thought it was maybe a garbage truck," another resident said. This is an occupied three-story building a block from the beach and city officials are investigating. The City of Long Beach says the 67-year-old building has no violations and that residents have not filed any formal complaints with the city's Building Department. "The Building Department is here on scene, and I know we'll be checking the history and doing a full investigation and coordinating with all the proper parties," said Jack Schnirman, City Manager. Tricia McNulty lives in the one of the apartments. 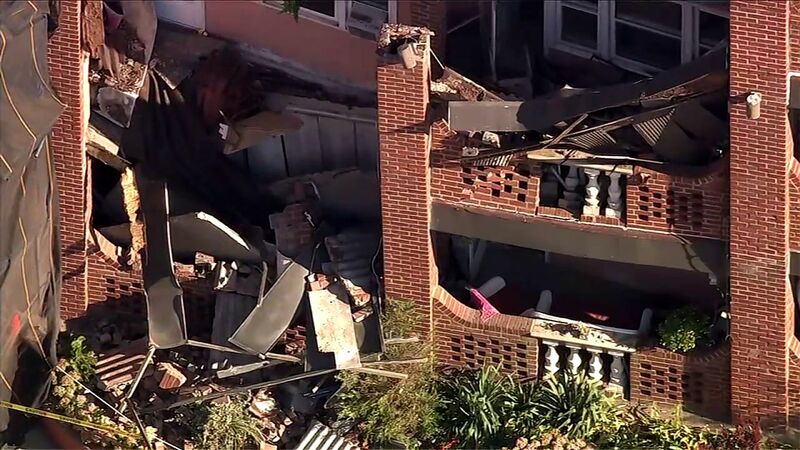 It was her balcony that came crashing down first, causing several more to collapse. She showed Eyewitness News pictures she says she's been sending for months to her landlord about decaying bricks on her balcony. "I spoke to the lady below me this morning and told her not to go on her balcony, my balcony is about to collapse and I told her to take everything in," she said. "I Left early today for work. I'm very blessed I left early." Eyewitness News asked the landlord Carmine Tepedino about the photos. "Tenants always come up with different stories. As soon as we found out there was a need to repair, we called a couple of contractors and we got one who started work," Tepedino said. Tuesday afternoon, engineers decided all the balconies needed to come down because of brick and concrete decay. Residents of 18 apartments are not being allowed back in. "I think they said two days they have to knock down all the balconies. I have a place to stay thank God with good friends in the neighborhood," said Lauren Beattie, a tenant.